How does Visual Composer Work? Home › Home › Visual Composer	› How does Visual Composer Work? Visual Composer normally works as an Add & Edit Elements for front-end pages. These settings can have a set of tools available, and it depends on the theme and plugins which works exclusively with Visual Composer. It’s an easier method to edit separate parts of your front-end elements, that enables you to organize and enable custom functions for each one differently and effortlessly. When you click on a page or create a new one, you’ll see a well-organized editor, giving you the possibility to drag elements within predefined grids, options to edit columns, rows etc. Let’s take a look at which elements are available to add. This option will give you a set of tools that you can add directly to your page. Depending on how many plugins you have installed into your WordPress, some options may appear in this section. The screenshot below exposes the default model, without additional plugins. As you can see, a well-organized section appears. 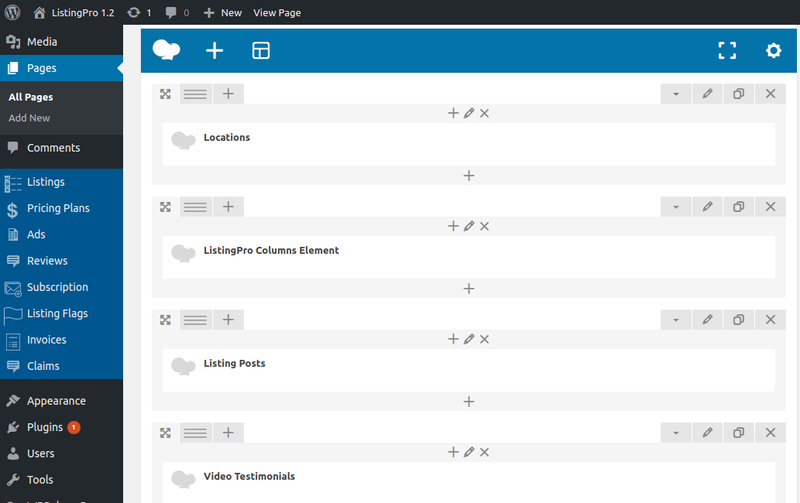 It gives you a broader picture of how many options are available to add to your pages. Each section is divided by Content, Structure, Deprecated, and our loved one ListingPro. Let’s take a look at the ListingPro section and see which elements are available there. These elements are all that you need to create new pages with ListingPro Elements. Don’t worry if you have excluded some ListingPro Elements before and got worried about how to add it back. In this section is where you can bring back to life some of these elements deleted.